What is Ken Livingstone's greatest strength? BJ - Don't always have relevant power but can use bully pulpit, grassroots organisations like Kids Company need support as do those which aren't "ideologically correct"
What would you do about people not paying on the bus? I was there last night and it was pretty obvious that B Johnson was the least perpared or indeed interested in London's future. He looked bored and bewildered through much of the meeting, his speech was stumbling and incoherent, his answers to questions predictable and uninsightful. I think you are a little unfair to Warwick Lightfoot who was easily the most knowledgeable and measured in what he said, but I agree with you about his manner being "unusual". He was the only candidate who acknowledged that many of Londons problems and the solutions are highly complex. Victoria Borwick was overprepared in my view and failed to answer a lot of the questions as she was so determined to stay on her key theme of crime. Andrew Boff certainly has some cockney charm and his delivery and manner is the closest to Ken's demotic feel, however he lacked a bit of substance i thought and seemed keen on the soundbites rather than policy. My main impression was that our supposed white knight seemed uncommitted. There was almost an air of guilt actually as he heard the other candidates, all of whom have a track record of committment to London, and probably realised that this isnt just another quiz show where laughs come easily. I was frankly disappointed in Boris! He was bumbling, waffly and ill-prepared and I am afraid he has lost my vote! Warwick Lightfoot is knowledgeable but I am afraid I marked him down when he mentioned that he was advising the Muslim community on setting up an alternative tax system - this to me would be the introduction of sharia by the back door and is simply not acceptable. The two best candidates in my view were Victoria Borwick and Andrew Boff. Victoria made a superb speech and Andrew's understanding of disaffected young people and the need to address their particular needs resonated with me. Both of them also spoke well on the subject of what needs to be done regarding the tube system. From the sounds of it Warwick looked to be the only candidate that came up with some solid ideas. Whats the problem with helping on a alternative tax law with Muslims as we are meant to be the party for all the communities know or is that only when it suits us? Referendums triggered by petitions eh? Has someone been reading UKIP's 2005 general election manifesto as part of their homework? Read my post again Peter! I said that it would be the introduction of sharia law by the back door and is simply not acceptable. We have debated the subject before on Conservative Home so I do not propose to go into it further here. I have to agree with the comments above - over all it was a rather nice but dull affair. I went in there fully expecting to vote for Boris. Now I am giving it more thought. He appeared unprepared, uninterested and certainly less knowedgable that the others. Victoria gave a passionate speech and came across very well. To me the star was Boff. He was charismatic, passionate and actually spoke on what he WOULD do, not what we would like to SEE happen. The more people that go to these hustings the more I feel it might not be a one horse race unless Boris ups his game. I was there in both a personal and professional manner. 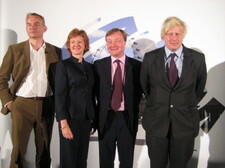 As for Boris being unprepared - perhaps I was sat at a different Hustings? The constant be-littling of Boris' character is becoming tiring. It is also amazing how on the Today programme this morning they managed to spin what I thought a positive event into a negative one. I thought the other candiates were the same old PR stunt masters - talking in political rhetoric regardless of the question. At least with Boris - if he was supposedly unprepared - it would have been from the heart..
Boris Johnson made a serious mistake at last night's hustings. When asked how he would cut waste, instead of limiting his comments to cutting out the waste that happens as a result of the mayor's activities in City Hall, he chose to widen his answer by promising savings from the Police and Transport for London budgets.What is extraordinary is that this was not some slip of the tongue. He made a point of identifying the police and transport budgets as areas where big savings could be made. What was interesting was that the candidate, Warwick Lightfoot, who proposed a tough, zero based budget for the spending that the mayor directly controls in City Hall, promised public service reform so that Londoners get value for money from the money they are spending. Lightfoot was careful not to talk about cuts in the police and transport budgets. Controlling spending in London, and public service reform, is his platform. It is clear from last night that Lightfoot has thought it through. At the first hustings of the campaign, for Boris Johnson to ramble into offering cuts in the London police and transport budgets, is simply naive and demonstrates a clear lack of understanding of London politics. I am going to another hustings later in the week. My wife saw the candidates on television and did not rate any of them. Her view is that only Boris could beat Red Ken. However, the reports on last night suggest that Johnson is not fully committed to the job. Pining for Henley? If I am unimpressed when I see the candidates perform, I will spoil my ballot paper and write in Steve Norris's name. Others may wish to follow my example. I am going to the hustings tonight in Ilford - is any one from ConHome going to this event? Will be interesting to see if any one from Boris's campaign has read these comments and if Boris will up his game.. COMMENTS THAT START ATTACKING OTHER COMMENTERS WON'T BE TOLERATED. I was there last night aswell. I have to say I got a very different impression to those above. Whenever Borwick spoke she referred it back to crime, her tale was depressing and boring and she that smug grin has to go. When she spoke most people cringed and looked at each other. That was what actually happened. Also her focus on crime was disingenuous because the Mayor has very little power over police, prisons etc. She was simply awful. Lightfoot was knowledgable. Some of his ideas were good. But he has no charisma or gravitas and kept dropping into every sentence how he was policy adviser here or economics adviser there, which was tedious and which people generally found pretty embarassing. Boris looked as if he was the cheshire cat sitting in the tree waiting for the inevitable win, after which he can take the cream of the policy ideas from the others into the mayoral election. It will probably work but he needs to buck his ideas up. He probably lost a few supporters last night. But he comes across as a nice bloke, which he obviously is, and of course Boris as our candidate would engage voters who perhaps don't usually like politics. Boff was the surprise package. His speech wasn't overly impressive but solid. But some of his ideas (such as reducing City Hall and orbital transport links as well as support for cyclists) were excellent. He wasn't too depressing, didn't focus on crime and the usual yobs-youths-hoodies-ban them all agenda. He actually stuck in the main to areas where the Mayor actually does have some power. He struck me as a more socially liberal version of David Davis (perhaps without the gravitas) in the way he spoke. He seemed pretty libertarian and I liked his proposals to re-engage voters. So I come out of this still a Boris voter. He is the only one who can beat Ken. But I hope that Boff continues the good form and that it forces Boris to up his game. If he doesn't, the race could be open again. I don't think Boris is the only one who can beat Ken. The party convinced us we needed a celebrity, then we got Boris, so Boris the celebrity is the only one who can win. I think this is dangerous and unfair on the other candidates. If Boris doesn't prove that he really thinks this is the greatest city in the world then people won't vote for him. I just urge people to vote for who they think will make the best Mayor, as tempting as it is to vote for the person you most think will win...if you think Boris is both then easy for you!! At the risk of sounding just a tad conceited, here's a tract of the speech I gave at the 2003 Hustings. "The Conservative Party has only ever succeeded when it has expressed its Conservative beliefs with radical policies. Socialists and corporatists will never trust the people. That is why I believe that we need to experiment in London with voters initiatives. Direct control of the government of London through a popular vote." I'm shamelessly partisan for Andrew (I was the embarrassed looking fellow in the ill-fitting Asda teeshirt with "Choose Boff" ironed onto the front, who kept trying to give you another leaflet) and so I thought he was the best of the 4 candidates last night. They all had good points though, which is one reason this primary process is so valuable. Whoever emerges as winner is going to have learned from their competitors in the Tory race, and it would be an odd person who (for example) didn't pick up on and harness the enormous intellect that drives Warwick's approach, the crime-focus of Victoria, the affable "one London" of Boris or the very very genuine concern (and effective solutions) about deprivation from Boff. Chris Heathcote - I will be in Ilford tonight - in the same embarrassing teeshirt - if you can manage it please come and say hello! One thing in Andrew's speech which annoyed me, because I don't think he was explicit enough, was that when he was talking about the success of Broadway Market in regenerating Hackney, he was talking about an initiative for which he was one of the champions. His vision for mayor is to be the engine for initiatives like that all over London. I think he wasn't clear enough about that, and some in the room may have thought he was merely singing the praises of one particular community project. My comment on process: 5 minutes per candidate is daft: give them 10 minutes each. Allow them to *debate* with one another - last night strived just a bit too hard for unity of approach - they are all really good people, they're not going to fall out with one another - please, chairs of the remaining meetings - let's have a proper debate. Thanks Becky. Fair point. It is hard to keep an open mind when, probably, some of those out there who are not natural Conservatives will convert to the 'Boris faxtor'. It does make you wonder whether sound policies are enough. Good to see the candidates use this site! Well Andrew anyway. If you are out there Andrew, get your initial speech tidier and you will win over more people. When you said you didn't want to take up the full five minutes I thought to myself: "6 million plus people and he can't fill a minute or two?". But in the Q&A you were a cut above the others so the best of luck. I thought Warwick was very grey, and that Borwick's performance was much better than Boff's. A very good and fair analysis otherwise. I arrived late, so I missed Victoria’s and Warwick's speeches. Boris was Boris - but he didn't have anything interesting to say and, yes, he looked bored. It was Boris' hustings to lose - and he did just that! Andrew Boff was brilliant, but Warwick has an eye for detail and Victoria has really improved since I last heard her speak in 2004. The trouble is, many Conservatives would have voted for Boris on the same day as their ballot papers arrived - without giving serious consideration to the other candidates and their policies. Really depressing. Graeme I saw you!! I was the one who winked at you as I came out and you tried to give me another leaflet!! I agree 5 mins is way to short. The Q&A should alow debating between the candidates allowing them to challenge and/or support the different points made. Londoner tonight will be in Ilford - off his home turf owing to the strange phenonemon of having a life such that I could not go to the more central one last night. I may say hello Graeme. I think you can be pretty sure that all camps will be reading this thread with interest. The interesting question will be whether any of them are sufficiently flexible to tweak their act to take account of it. Graeme, I agree with you about the length of the speeches - they do need a little more time than 5 minutes to develop their theme adequately. I also thought they would debate with one another more and as you say, they are not going to start falling out with one another. I agree with much of what Matthew has written, and have only to add my own disappointment at Boris Johnson's performance. VB's smirks at various points while other candidates were speaking were clearly unjustified -- she didn't exactly come across as a dead cert candidate herself! I noticed BJ smiling at a couple of points made, this seeming fairly representative of his relaxed attitude towards the evening. He didn't appear to have put much thought into the substance, the policy, of his campaign. This certainly contrasted with the candidate who came across very well, Andrew Boff. By the middle of the Q&A I had developed prejudices against VB for her smugness and lack of a grip on reality, and against WL for a subtle whiff of insincerity, partially sensed in a 'conversation' before the start of the event. Thus I was relying on AB and BJ to seriously address my question on re-engaging young Londoners in politics. Boff suggested incentives, but didn't go into too much detail on this. BJ frustratingly resorted to jokes about breakdancing down Whitehall, and frisky young people. Well done, but where is the substance? His claim that young people will automatically beocme engaged as they gain a stake in society through paid jobs etc, was undermined by a point made in the original question -- namely the shockingly low turnouts in recent elections. Unfortunately our currently climate doesn't seem ripe for someone like Boff to win (in that his style is so much more 'down to earth' than the others) , but he'll get my vote. Let's hope that Boris Johnson can sort himself out. He 'reserved the right to make jokes' in his campaign -- let's hope that he wasn't reserving the right to make his campaign a joke. "Graeme I saw you!! I was the one who winked at you as I came out and you tried to give me another leaflet!!" Is anyone going to Friday's? And on a purely practical note, what time do you think it will finish? Please note the Q&A notes that I added to the end of the post, might be useful for jogging memories. Totally agree on Boris- he really needs to raise his game tonight otherwise we're going to start to get the jitters about him. Well BJ or his team must have read some of the comments today because his performance in Ilford tonight was first class. I was in two minds about going after reading about the first one but it was a really good event. He gave a really good speech and seemed fully engaged throughout the whole thing. Hope he keeps it up for the rest of them! and probing questions that will undoubtedly be thrown at him. One of the things I did notice was the amount of press at the launch. Every time Boris spoke, the hacks were there opening their notepads with their pencils at hand, waiting for the killer headline. It was quite amusing. As for the other candidates, Andrew Boff was confident, and gave a good overall performance. I was actually quite impressed; he spoke as a normal Londoner. Lightfoot and Borwick, i'm not quite sure about. I don't particularly like politicians who refer to people as "those/these youths",etc.., may be it's a K&C way of speaking, but as Mayor, you need to appeal to supporters in Cricklewood, Dagenham, Ilford, New Cross, etc... I got the general impression that they hadn't ventured far outside the king's road or kensington high street. I agree with Eliza that the performances in Ilford last night, including particularly Boris's, were excellent and very different from what was described from the first one. The "raising of the game" generally was confirmed to me by Graeme Archer of this parish, who had been at both. Editor, I have some other comments to make but, before I do so, is there to be an official report on here and a new thread, or should I continue here? New thread may be better. I have to agree with some of the other comments made about Victoria Borwick. I have come across her a couple of times and she is simply awful! Her literature was also very poor: "A red head not red ken" and "last time it took a women to beat Ken" etc. Can you seriously imagine her taking on Ken Livingstone and winning? So Tim you saying the policy know that I can't answer back attacks on me by other people?